Acadia & Jefferson Davis Parishes, Louisiana - Teche and Bandito Prospects - Target Energy - Australian petroleum exploration and production company. Target Energy - Australian petroleum exploration and production company. Click here to read The Imperishable Permian Basin article provided by the Independent Petroleum Association of America (IPAA). Target's Fairway Project in the highly sought-after Permian Basin in West Texas consists of approximately 2,080 gross acres, held by production (net 1,011 acres to Target) and up to 884 acres (net 476 acres to Target) in undeveloped leases, with the Company holding working interests ranging from 33.75% to 60% (average 50.2%). The operator is Trilogy Operating, Inc. out of Midland, Texas, a company with a long history of drilling successful wells in the Permian Basin. Added 2P reserves of 1.0mmboe net to Target. 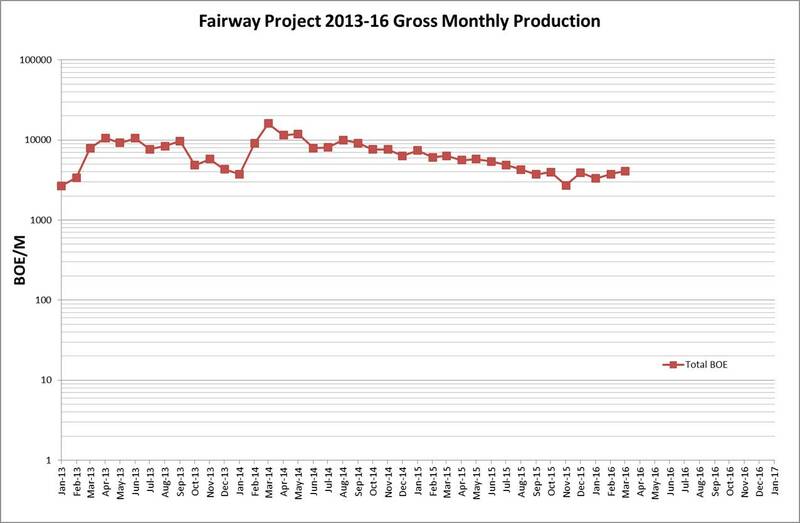 The graph below shows Gross Monthly Production in the Fairway Project.